While waiting for retrievals at the National Library in Edinburgh, I scooted outside to practice my photography skills. Note to self: Surely the quantity I take will result in some quality. Two minutes away was one of Edinburgh’s iconic historical sites. The entrance to Greyfriars Church and cemetery is all but unnoticeable except for the landmark pub. Something about a faithful dog called Bobby rang a faint bell. My ignorance of the history here was excusable, I felt, having no ancestors in the city or surrounding vicinity. Then I learned the full name is Greyfriars Tolbooth and Highland Kirk. That made me feel slightly connected, combined with immense respect for the GREY spelling which I’ve always preferred to GRAY. Mary Queen of Scots granted the land as a town burial ground in 1562 at a Franciscan monastery, preceding the kirk itself. From 1682 the church building has been through numerous disasters, changes, and restorations. Now I’ve misplaced my brochure of pathways and monuments so I will have to crib a little from the Internet. It was good to see that Greyfriars Kirk today is an active congregation despite tolerating daily measures of gawking tourists. Thanks to http://www.greyfriarskirk.com for the sign. Bobby? 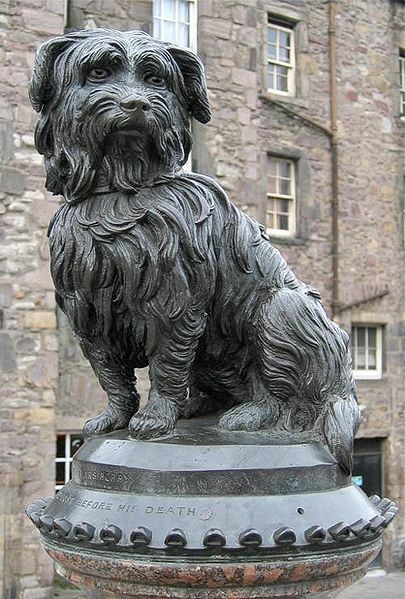 He was the loyal 19th century terrier who mourned his master’s passing by guarding his best friend’s burial site at Greyfriars for fourteen years. No question, Bobby deserves his own monument. The doggy story has some slight variations in the telling, but Bobby was himself interred just inside the gate, not in the kirkyard per se, himself not having the exact proper credentials. Trying to get a decent shot of his modest statue, uncluttered by sightseers and assorted Edinburgh youth, is nigh impossible. Thus I thank Wikipedia for this photograph. Many luminaries of Edinburgh and Scottish history lie within the grounds ... individual monuments, family sarcophagi. As in most ancient cemeteries, some have weathered badly, others have been sealed to prevent vandalism. One would need intensive study to know who all these people were, many of whom had their moments of fame. Centuries of interments created layers of remains and raised the original ground level. But still, seventeenth and eighteenth century monuments predominate. 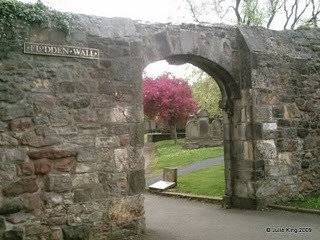 Flodden Wall at the edge of the churchyard is a remnant of the fortified wall built around Edinburgh after the famous battle in 1513. Self: I am so into the 16th century now! Instead of acting as a deterrent against the English, it became a barrier for southern expansion of the city’s Old Town, forcing its tenement buildings to rise to notorious heights (the higher the better for the olfactory factor). Again, I am indebted to Edinburgh's Dark Side (see below) for a quality photo which escaped me. 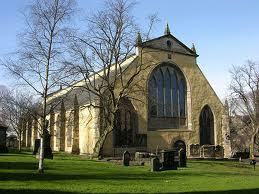 The National Covenant of Scotland was signed in this church to establish the independence of religious rite. The Covenant was not without trouble and setbacks based on the preferences of ensuing rulers. In 1679 about 1,200 Covenanters were imprisoned near the church in dreadful conditions, Lord Advocate George Mackenzie being their most zealous persecutor. Many died and others were tortured or put to death. Although these family plots became known in popular lore as the prison cells, apparently the original imprisonment location was nearby. Mackenzie himself has an impressive tomb here, spawning scores of poltergeist reports. The daytime dignity of Greyfriars has a parallel life. Its history of suffering, executions, body snatchers, grave robbers, and vandalism (disrespect for the dead still occurs today) renders it a genuinely spooky place after dark. This odd little "wee" shop at the entrance caters to paranormal interests, especially Mackenzie’s ghost. "Dead of Night" tours are on offer if you’re willing to risk poltergeist phenomena or strangely unaccountable bruises and scratches. Mind you, assorted nighttime ghost tours all over the Old Town are popular and competitive. Pretty heady stuff for a break before returning to the library. Somehow, turning in to Bobby’s pub instead would have been more fun. Self: Work a little harder at photographic skills. A couple of places for some good shivers are Edinburgh’s Dark Side and Greyfriars Graveyard. We family historians get quite excited at discovering a black sheep. Why do we react that way? Well, we know our ancestors weren’t all boring, diligent farmers and blacksmiths and housewives and students and salesmen and clerks and milliners. One might think so from the too-often little we can dig up about them. Someone who disturbed the norm, caused problems, or attracted attention, usually in a negative way, ... in so doing created written and remembered versions of the event(s). It works the other way as well: ancestors who did something admirable, beneficial, or creative also leave their marks. Our ancestors were human and faulty like us. Finding written sources about bad acts gives us some insight not only into the individual, but perhaps also about the effect on the family and the community. Dealing with an ancestor and event a couple of generations ago, we have distance from the original emotional consequences and pain. The following became of interest because of the name, although there is no family connection. It’s a matter of record that a man called Neil McFadyen murdered James Kerr in Nova Scotia in 1848. What “record”? I have only two sources relating the story with slightly differing details. The Life and Adventures of Detective Peter Owen Carroll by N. Carroll McIntyre was my first encounter. This version implies MacFadgen met James Cair right off the boat, so to speak, at Pictou, and took him to his home at Blue Mountain [written in the vernacular, the author uses phonetic surname spellings]. The next day Kerr was murdered for the cash he carried to purchase some land. The body was soon found but not identified until Kerr's father arrived from Scotland to search for his son. Identification was made from some of his clothing but more significantly by a lump on his jawbone from a childhood accident. It was known that McFadyen was the last person to see the victim. The other version is a narrative of the coroner’s inquest in Nova Scotia Archives & Records Management (NSARM). I have a partial transcription without an archival reference. To me, it appears to be what a newspaper reporter might have published. Here we learn that Neil McFadyen arrived in Cape Breton with his father’s family in 1827 from the Isle of Tiree. He married a McKinnon woman (no first name) in 1830 and moved to “Moose River near the Garden of Eden, a lonely place in the back settlements of Pictou County” where he built a log house. He had “a number of children.” With a minor history of theft incidents, he went to work at a lumber camp in Chaleur Bay, New Brunswick. That’s where he met the unmarried Kerr, whose dream was to buy a farm, and beguiled him with tales of good land back in Pictou. Apparently Kerr’s father was already on this side of the Atlantic, in New Brunswick. Two months or more elapsed until Kerr’s father and a brother were alarmed enough by the lack of communication to come to Pictou. Identification of the decomposed remains was dependent on clothing details. Then Kerr's vest and other possessions were found in McFadyen’s home, so Neil McFadyen went to trial on circumstantial evidence. He was convicted and hanged on 20 December 1848. My enquiry to municipal authorities revealed the improvised hanging took place on the beach at Pictou where he was buried under the sand with no marker. Two derivative sources ... telling us something about Kerr and his family but not so much about the perpetrator. A descendant would be looking for potential court records, newspapers, census returns, to try to form a more complete sense of the man. We’d like to think McFadyen’s wife and children eventually overcame this trauma and found some normalcy in their lives. BCE Place, Toronto, photograph by BDM.